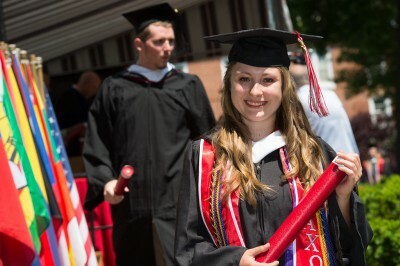 The world is changing rapidly, but University of Lynchburg and its newest graduates are ready to embrace those changes, according to speakers at the 2015 commencement on Saturday. Nearly 700 students, including 541 undergraduates and 140 graduates, received their degrees as the sun shined brightly on the Dell. 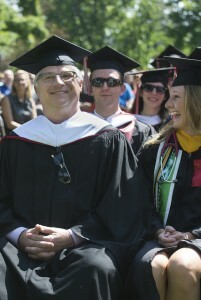 The ceremony also included a surprise graduate—Cyrus Krohn ’94, the commencement speaker. Because he finished college one semester early and did not return for his own graduation ceremony, Krohn’s parents had never seen him receive his degree. But they were present Saturday, so Krohn left the stage and sat with the Class of 2015 for a moment until Dr. Julius Sigler, vice president and dean for academic affairs, called his name. Krohn walked across the stage, received a diploma, and returned to the podium. Krohn said he would not tell the graduates to pursue careers in technology, as he has done, but he warned them that they cannot avoid it. “No matter what you choose to do in your careers technology is going to impact your lives,” he said. As a digital strategist who has worked in online publishing and politics, he has experienced technology’s transformations firsthand. Speaking briefly about how technology will change politics, media, parenting, and medicine, he said that the world depends on today’s students to adapt to—and lead—those changes. Polly Flint ’71, ’73 MEd, chair of the LC Board of Trustees, remarked that LC has thrived because it has responded to the changing world and added educational programs that serve students with relevant skills and knowledge. The College will continue to do so, she said. Senior Class President Erin Mitnitsky ’15 reflected on the lessons she and her classmates have learned during their time at LC. Since their class enrolled at LC, the College community has completed more than 200,000 hours of community service, and the graduating class has led the school to outstanding accomplishments on the academic field. But they also have gained a strong, flexible education that will allow them to pursue a variety of fields.